Deep can­yons, crystal-clear streams, high mesas and carved lime­stone cliffs characterize this dramatic terrain. Located on the south­western edge of the Edwards Plateau, Garner State Park is part of a unique sub-region known as the Balcones Canyon­lands. Edwards limestone uplifted millions of years ago, creating steep canyon walls and some of the most spectacular views in the Texas Hill Country. The rock formations in the park were created in the Cretaceous age, which lasted from 138 million to 63 million years ago. The Glen Rose formation, a collection of limestone, shale, marl and siltstone beds, formed from sediment along the shifting margins of an ancient sea. Dinosaurs roamed there and left footprints in the sands. The sea then spread over the rest of Texas, depositing the Edwards formation (limestone) over the Glen Rose beds. 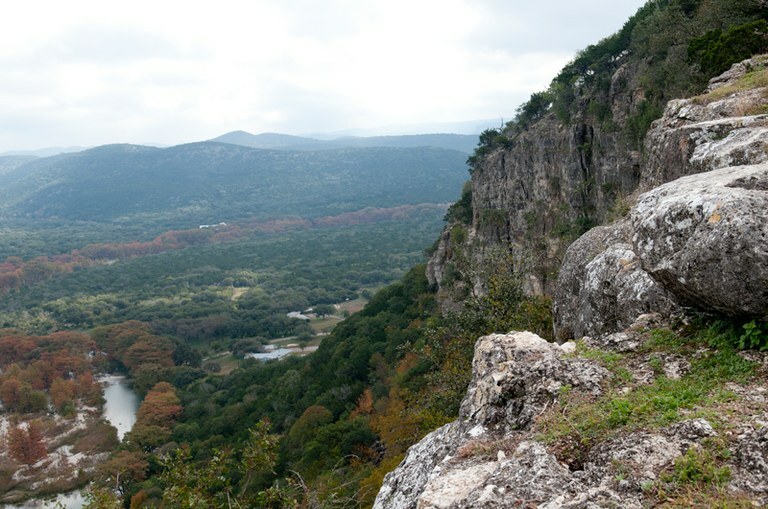 This layering—Glen Rose below, Edwards above—is found throughout this area. The Frio Canyon has long been known for its abundant wildlife. Park visitors will see white-tailed deer, black rock and fox squirrels, raccoons and many other species. Rio Grande turkeys, mourning doves, black and turkey vultures, eastern bluebirds and several species of migratory birds reside here. Non-native species compete with native wildlife and negatively impact their habitats. Garner’s primary exotic, Axis deer, competes with native white-tailed deer for food. Golden-cheeked Warbler: The endangered golden-cheeked warblers nest only in the mixed Ashe juniper and oak woodlands of Central Texas. They nest from March to July, and spend the winter in Mexico and Central America. 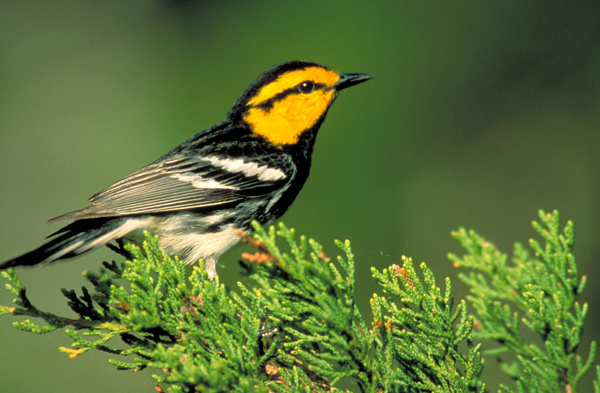 Warblers eat insects and spiders from oaks, and use long strips of cedar bark and spiderwebs to build nests, where they lay three to four eggs. Loss of nesting habitat has reduced golden-cheeked warbler populations. Check out this TPWD video of a golden-cheeked warbler nest with chicks. Black-capped Vireo: Black-capped vireos (recently taken off the endangered species list) also nest in Texas in the spring (April to July) and spend the winter on the west coast of Mexico. These tiny birds nest in low-growing shrubs and return each year to the same nesting area. Males sing to attract mates and to defend two- to four-acre territories. The loss of low-growing shrub habitat (due to grazing, clearing and fire suppression) has led to this bird’s endangered status. Watch this TPWD video of black-capped vireo nests. Because the park’s canyons angle southeast to northwest, prevailing winds cool and moisten the area and allow lusher vegetation than normal for this region. Especially noteworthy trees are Texas madrone and lacey oak. The steep slopes and canyons shelter some very old Ashe junipers. Magnificent bald cypresses line the Frio. 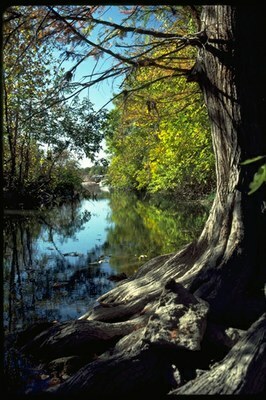 Bald Cypress: Bald cypress trees add grace and beauty to many Texas waterways, including the Frio. These trees can grow to 120 feet and live up to 600 years. Bald cypress drop feathery leaves very early in the fall and bud late in the spring, hence the name “bald.” Knobby “knees” push up from submerged roots. Bald cypresses provide nesting places, food and shelter for wildlife; slow floodwaters; and trap sediment and pollutants. Texas Madrone: This uncommon native is a 20- to 30-foot evergreen tree. Its unique trunk has polished, red, inner bark. White flowers appear in spring, followed by red or orange berries. Madrones grow from Central Texas west to the Guadalupe Mountains, and south to Guatemala. Just for kids: Leave it to Leaves: All living creatures depend on them. Garner State Park is a precious jewel of the Texas Hill Country, a prize worthy of our protection. Garner has been the most popular state park for overnight camping since it opened in 1941. That popularity has led to some problems, however. Litter is an ongoing problem; it harms wildlife and reduces the park’s beauty. Heavily used trails suffer from soil erosion and compaction. Abundant wildlife meeting up with abundant humans can lead to problems for both. You can help us protect this jewel by picking up litter, staying on trails, and not feeding wildlife.